The 4th of April is a date that will never be forgotten by the people of Pakistan as it was on this day in 1979 that former Prime Minister Zulfikar Ali Bhutto was executed. Bhutto was born into an elite family in Larkana, in the Sindh province of Pakistan on January 5, 1928. His father Shah Nawaz Bhutto was Prime Minister of the princely state of India, Junagadh. Zulfikar Ali Bhutto was educated at Berkeley and Oxford and trained as a Barrister at Lincoln’s Inn. He was arguably the most outstanding and charismatic leader ever born in Pakistan and the region. He changed the political system and successfully snatched the country from the elite, handing it over to the downtrodden people of Pakistan with the belief within his own political manifesto that ‘all powers lie with the people’. He established the Pakistan Peoples’ Party (PPP) on 30th November 1967 at Lahore, Bhutto’s politics and name ruling Pakistan ever since, despite facing opposition from the nation’s powerful army establishment and all political and religious parties, including the United States. He created a rare enthusiasm in the political arena of Pakistan and his die-hard workers who were ready always to sacrifice their lives for him and his name. He become the ninth but the first popularly elected Prime Minster of Pakistan from 1973 to 1977. 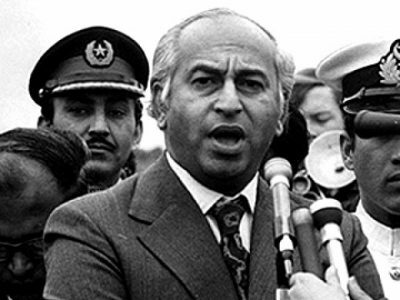 His party won the election again in 1977; however a conservative political party alliance, the Pakistan National Alliances (PNA), backed by the US and army establishment of Pakistan, alleged widespread rigging and civil disorder subsequently escalated in major cities across the country. Finally on 5 July 1977, Chief of Army Staff (COAS) General Zia-ul-Haq deposed Bhutto in a coup and controversially and intriguingly tried and executed Bhutto by the Supreme Court in 1979. The allegation was leveled against him that he had authorized the murder of a political opponent, Nawab Mohammad Ahmad Kasuri, which was never accepted by the people of Pakistan. Zia however did not succeed in ending Zulfikar Ali Bhutto’s name or his party, as the PPP remains one of the largest in Pakistan. His daughter Benazir Bhutto would also emerge as Prime Minister after winning the election in 1988 following Zia’s death in an air crash. The very famous phrase ‘Jeay Bhutto’ (long live Bhutto) even today continues to be heard, as the establishment were believed to have killed a number of his followers in Pakistan through fake accusations in the courts under martial law. Bhutto was removed from power in Pakistan by force on 5 July 1977, after the usual party on the 4th at the U.S. Embassy in Islamabad, with US approval, if not more so, by General Zia-ul-Haq. Zulfikar Ali Bhutto was falsely accused and brutalized for months during proceedings that corrupted the Judiciary of Pakistan before being hanged. Is it possible that a rational military leader under the circumstances in Pakistan could have overthrown a constitutional government, without at least the tacit approval of the United States? Why did America go against Bhutto? In 1974, India carried out a nuclear test, codenamed Smiling Buddha, near Pakistan’s eastern border. Bhutto unsuccessfully lobbied for the United States to impose economic sanctions on India. However, at the request of Bhutto, Pakistan’s Ambassador to the United States convened a meeting with Secretary of State Henry Kissinger. Kissinger told Pakistan’s ambassador to Washington that the test is “a fait accompli and that Pakistan would have to learn to live with it,” although he was aware this was a “little rough” on the Pakistanis. Therefore Zulfikar Ali Bhutto continued to administer the research on weapons. In 1976, Kissinger immediately travelled to Pakistan to hold a meeting with Bhutto, offering an expensive package, but Bhutto was unconvinced and refused the offer. The meeting was ended by Bhutto as he replied: “For my country’s sake, for the sake of the people of Pakistan, I did not succumb to the blackmailing and threats.” Bhutto and his cabinet walked away and left Kissinger and his delegation alone in the room. This all happened during the presidency of Jimmy Carter and, despite Richard Nixon having a strong relationship with Bhutto and being a close friend, relations fell significantly under Carter’s presidency. Carter tightened the embargo on Pakistan and placed great pressure through the US Ambassador to Pakistan. The reason for this it is believed was that Jimmy Carter was irritated with Bhutto’s socialist orientation; the US greatly fearing the loss of Pakistan as an ally in the Cold War. The leftists and Bhutto’s policy towards the Soviet Union were viewed sympathetically by them and had built a bridge for the Soviet Union to gain access to Pakistan’s warm water ports, something the US and USSR both sought. Bhutto had to face pressure from the American President who was totally against the political objectives Bhutto had set forth for his upcoming future plans. Carter indirectly announced his opposition to Bhutto, his ambition and the elections. Carter keenly sabotaged Bhutto’s credibility and instigated intrigue against him. Zia finally hanged him, proving what Henry Kissinger said to Bhutto to be correct. General Zia tried his level best and forced Bhutto to surrender but Bhutto never gave up. Bhutto refused all the way, even refusing to file a mercy petition to the President of Pakistan, as at that time the President was General Zia. 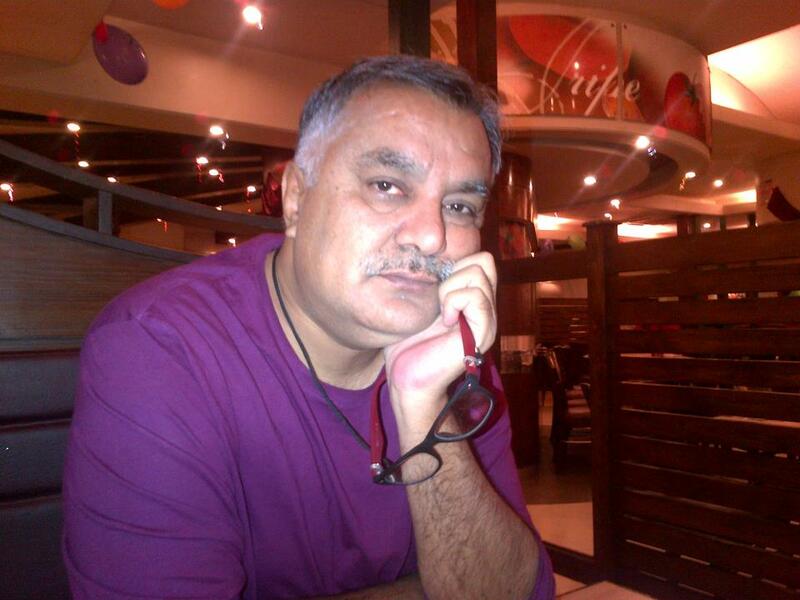 He also requested that his family must never be a cause of shame to him by appealing to Zia for his life. An outstanding man died with honor not begging for his life as he was confident, as everyone in Pakistan knows, that he never planned to kill Kasuri, as accused. He himself once said it was not in him to get anyone killed. The people of Pakistan and especially the people of Sindh consider his death a modern day repeat of the incidence of Karbala, as one by one both Bhutto’s youngest sons and his daughter Benazir Bhutto, the first ever female Prime Minister on two occasions in Muslim history, had all been killed. Zulfikar Ali Bhutto’s wife Nusrat Bhutto withdrew from public life following the shock assassination of her older son Mir Murtaza Bhutto, her youngest son Shahnawaz having previously been killed in France. She was alive at the time of her daughter Benazir Bhutto’s assassination but was already too ill and unable to comprehend the news, later passing away, being buried next to her husband, two sons and daughter. Good analysis - no doubt, ZAB was an outstanding and charismatic leader; and the downfall of Bhutto dynasty is always remember as a tragic history. However, don't you think; Bhutto’s policies and style of governance were contradiction of his liberal and socialist ideas?. Declaring Ahmadis non-Muslim and making Friday as public holidays were some of the actions that advanced the foundations of a theocratic society; he actually didn’t more than what could be expected from the conservative and religious party leader.